Azaleas are one of the most popular landscape plants in Houston according to the experts at the Texas A&M AgriLife Extension. Azaleas love the humidity in Houston but require the addition of amendments, when planting, to acidify the alkaline Houston soil. Once established, azaleas do well without any fertilizer whatsoever. There are times, however, when the leaves of the plant will yellow, telling you that perhaps a little boost of fertilizer is in order. 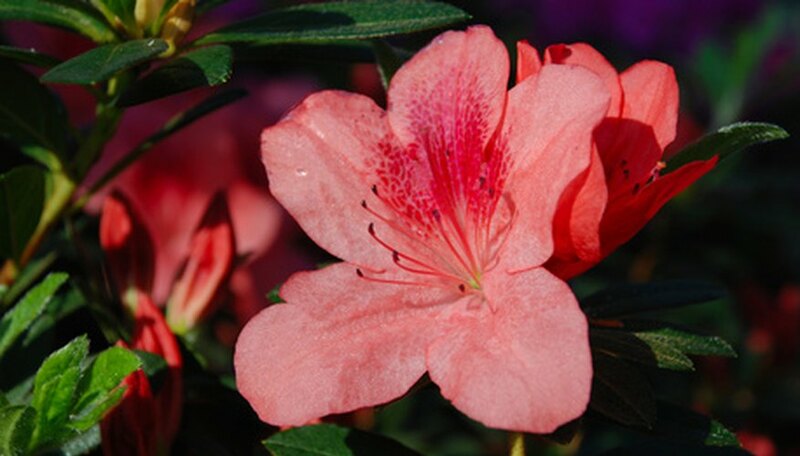 Fertilize your azalea in Houston between February and May. Rake the soil around the azalea. Remove any mulch and debris out to the ends of the longest branches. Scatter the fertilizer over the raked area. Experts at the U.S. National Arboretum suggest that you not apply more than 3 tbsp. of fertilizer per application, as too much may burn the plant’s roots, especially in the heat in Houston. Water the soil until the top 3 inches is moist. This will help the fertilizer get to the azalea’s roots. If there is no rain in Houston over the course of the next three days, water the soil again to keep the fertilizer moving through the soil. Lay down 3 inches of pine bark mulch beneath the azalea, keeping it 2 inches away from the bark. The mulch will decompose and provide the azalea with nutrients. Mulch also protects the shallow roots of the azalea from the hot Houston sun. Scientists with Texas A&M University urge you to have your soil analyzed prior to using chemical fertilizers on your azalea. This will help you avoid over fertilizing and to know exactly what the plant requires. United States National Arboretum: When Should I Fertilize My Azaleas?